●Body temperature is maintained within a narrow range by balancing heat load with heat dissipation. Evaporation is the principal mechanism of heat loss in a hot environment, but becomes ineffective above a relative humidity of 75 percent. The other major methods of heat dissipation, including conduction and convection, cannot efficiently transfer heat when environmental temperature exceeds skin temperature. 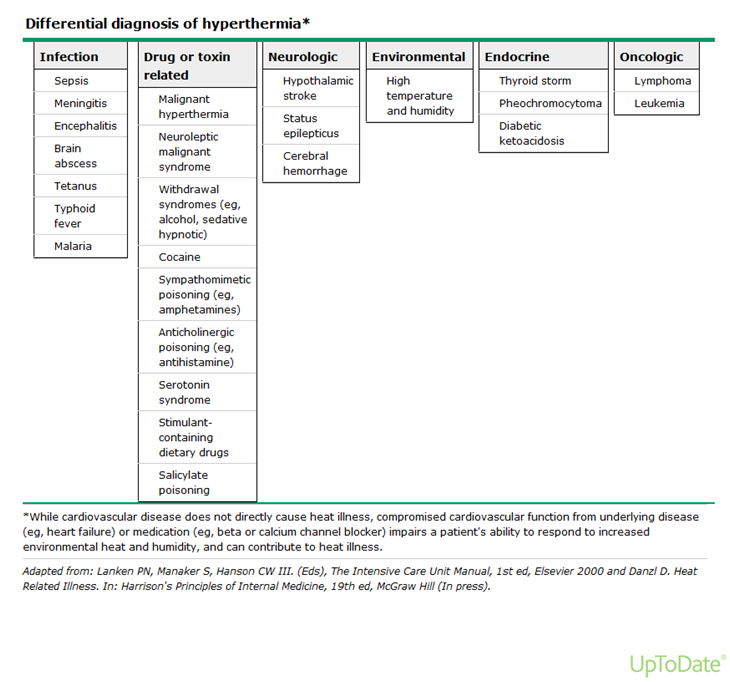 ●The differential diagnosis of hyperthermia is extensive and includes infectious, endocrine, central nervous system, and toxic etiologies. The most important causes of severe hyperthermia (greater than 40ºC [or 104ºF]) caused by a failure of thermoregulation are heat stroke, neuroleptic malignant syndrome, and malignant hyperthermia. ●Severe nonexertional hyperthermia (classic heat stroke) carries a high mortality rate. Mortality correlates with the degree of temperature elevation, time to initiation of cooling measures, and the number of organ systems affected. ●The diagnosis of nonexertional heat stroke is made clinically based upon an elevated core body temperature (generally >40°C), central nervous system dysfunction (eg, altered mental status), exposure to severe environmental heat, and the absence of another explanation for hyperthermia. Patients with classic heat stroke generally have increased susceptibility to the heat due to age or underlying medical conditions. Diagnostic studies are generally nonspecific but may reflect cardiovascular, renal, or hepatic dysfunction, or coagulopathy. Studies to be obtained are described in the text. ●The management of nonexertional heat stroke consists of ensuring adequate airway protection, breathing, and circulation; rapid cooling; and treatment of complications. Tracheal intubation and mechanical ventilation are often necessary. Hypotension or volume depletion is treated with discrete intravenous boluses of isotonic crystalloid; alpha-adrenergic agonists should be avoided if possible. ●We suggest that rapid cooling of patients with nonexertional heat stroke be performed using evaporative and convective techniques (Grade 2C). Evaporative and convective cooling techniques are safe and effective in nonexertional heat stroke and do not interfere with patient access or monitoring, or other treatments. Cold water immersion may be harmful to elder patients; there is no role for antipyretic agents. Continuous core temperature monitoring with a rectal or esophageal probe is mandatory in all patients being treated for heat stroke. The management of exertional heat stroke is discussed separately. ●Nonexertional heat stroke can cause a number of complications, including respiratory and cardiac dysfunction, hypotension, seizures, rhabdomyolysis, acute renal and hepatic injury, and disseminated intravascular coagulation. Evaporative and convective cooling is the method used most often to treat classic heat stroke because it is effective, noninvasive, easily performed, and does not interfere with other aspects of patient care. When used to treat elderly patients with classic heat stroke, evaporative and convective cooling is associated with decreased morbidity and mortality. With evaporative and convective cooling, the naked patient is sprayed with a mist of lukewarm water while fans are used to blow air over the moist skin. Special beds called body cooling units have been made for this purpose . Agitation from an altered mental status or shivering induced by evaporative and convective cooling or other treatments may generate heat and can be suppressed with short-acting IV benzodiazepines, such as lorazepam (1 to 2 mg IV). Benzodiazepines may also improve core body cooling. If neuroleptic malignant syndrome (NMS) is not suspected and benzodiazepines are ineffective at controlling shivering, chlorpromazine (25 to 50 mg IV) may be used. However, chlorpromazine has anticholinergic properties and thus, may impair sweating and exacerbate hypotension. Other effective cooling methods are less commonly used in patients with classic heat stroke. Immersing the patient in ice water (cold water immersion) is an efficient, noninvasive method of rapid cooling , but it complicates monitoring and intravenous access, and may be harmful to elder patients . An alternative method that allows greater access to the patient is water ice therapy (WIT), in which the patient is placed supine on a porous stretcher positioned on top of a tub of ice water. Medical personnel continuously pour ice water from the bath onto the patient and massage major muscle groups with ice packs to increase skin vasodilation. Applying ice packs to the axillae, neck, and groin (areas adjacent to major blood vessels) is another effective cooling technique, but may be poorly tolerated by the awake patient. A small randomized trial, in healthy subjects with exercise-induced hyperthermia, reported that applying cold compresses to the glabrous (smooth, hairless) skin surfaces of the cheeks, palms, and soles led to more rapid cooling than applying them to the axillae, neck, and groin. This approach warrants further study in classic heat stroke patients with comorbidities that might impair peripheral vasodilatation. Cold thoracic and peritoneal lavage results in rapid cooling. However, it is invasive and peritoneal lavage is contraindicated in pregnant patients and those with previous abdominal surgery. Cooled oxygen, cooling blankets, and cold (ie, room temperature, or approximately 22°C [71.6°F]) intravenous fluids may be helpful adjuncts. Cold gastric lavage may cause water intoxication. ●There are no definitive studies supporting any particular approach to cooling in classic heat stroke. ●Evaporative and convective cooling methods for the treatment of classic heat stroke are better tolerated. ●Immersion in ice water is rapid and effective in young patients with exertional heat stroke. However, immersion therapy is associated with increased mortality when used to treat elderly patients with classic heat stroke. ●Pharmacologic therapy (eg, dantrolene) is ineffective and not indicated in the treatment of exertional or classic heat stroke. Pharmacologic therapy is not required in heat stroke. There is no role for antipyretic agents such as acetaminophen or aspirin in the management of heat stroke, since the underlying mechanism does not involve a change in the hypothalamic set-point and these medications may exacerbate complications such as hepatic injury or disseminated intravascular coagulation (DIC). Salicylates can contribute to hyperthermia by uncoupling oxidative phosphorylation. Dantrolene is ineffective in patients with severe temperature elevation not caused by malignant hyperthermia. In cases where the etiology of the patient’s hyperthermia is unclear initially and infection remains a possibility, empiric administration of an initial dose of antibiotics, following collection of appropriate cultures, is prudent, while cooling measures are implemented. Heat stroke is a condition that can happen when a person's body gets too hot. Most often, heat stroke happens when people exercise in very hot and humid weather without drinking enough fluids. But heat stroke can also happen in people who are not exercising. It is especially likely to affect older people and people who have health problems, so they need to be extra careful in hot conditions. Heat stroke is a medical emergency that needs to be treated quickly. That's because heat stroke can lead to death if it is not treated quickly. When people get too hot, they can also get "heat cramps" and "heat exhaustion." These conditions are not as serious as heat stroke, but they can lead to heat stroke if they aren't treated. Yes. If you or someone you are with has heat stroke, get medical help right away. Is there a test for heat stroke? ●Electrocardiogram (ECG) – This test measures the electrical activity in your heart (figure 1). The main treatment involves cooling your body down. Your doctor can do this in the hospital in different ways. Can heat stroke be prevented? ●Try not to be too active, and take breaks when you exercise. ●Drink enough fluids, such as water or sports drinks, so you do not feel thirsty. But don't force yourself to drink very large amounts in a short time, and don't drink so much that you feel uncomfortable. This can be harmful. ●Do any exercise early in the day, before it gets too hot out. ●Wear loose, lightweight clothes. Don't wear too many layers. ●Avoid being in a hot car. If you have symptoms of heat cramps or heat exhaustion, you should cool your body down right away to avoid getting heat stroke. ●Spray yourself with cool water and then sit in front of a fan. ●Move into the shade, or go into an air-conditioned building or car. ●Take a cool shower or bath. ●Drink water or a sports drink. Do not have a drink with alcohol or caffeine. ●Take off any extra clothing you are wearing. ●Put a cold pack or cool cloth on your neck or armpit.